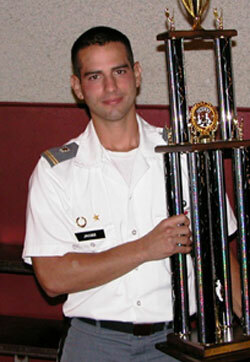 In the recent Armed Forces Championship, Westpoint Cadet David Jacobs topped a 60 player field. For the third time in a row, Jacobs came out ahead of established military men, including Colonels and Captains. Chessplayers and soldiers have this in common: Ranking is everything. Head TD and CLO correspondent Michael Atkins graciously supplied the following chart to help you understand how various military titles rank. If you were a soldier instead of a chessplayer, what would you be? Michael comments on this (totally unofficial) chart, "Chess ratings measure strength while military ranks reflect power and authority so it is a different "caste" system." Michael also points out that the majority of soldiers are E 1-2 privates, rather than in chess where the majority lies in the middle of the ranking system. Raising your rating may not get you a salary increase or a battalion to charge, but it will earn you respect during analysis and fear in the heat of battle. West Point Cadet David Jacobs made it a military "threepeat" when he won the US Armed Forces Open (October 7-9) for the third time in a row. Held at the US Armed Forces Retirement Home in Washington DC, the tournament annually attracts active duty, retired, reservists/guard, and military academy chess players from around the country. 3.Air Force Lt. Colonel Doug Taffinder (3rd on tiebreak), Ieva Kuzminaite, David P. Gavin, James D.Adkins, Peter Carl Andreas, Zachary Kinney, Thomas J.Belke and Eugene W. Sung. The commander-in-chief trophy for the highest scoring Academy went to the U.S. Military Academy at West Point, closely followed by the Air Force Academy. The U.S. Naval Academy team, the smallest of the academies' teams, had trouble with their land-based transport on the final day. Perhaps they would have done better if the event had been at sea! Third-year Cadet Jacobs hasn't played much rated chess since entering West Point. Aside from this year's US Amateur Team East, winning the last three Armed Forces Opens has been his sole activity. That seems to be the case also for the second highest-rated cadet, Lithuanian exchange student Ieva Kuzminaite. She finished with 4.5 points and was joined by fellow Lithuanian exchange student Vidas Sinica, whose crisp military look won him the Best Military Presence award this year. The other female cadet was West Point's Shireen Baqer, playing in her first tournament and scoring a win in the penultimate round. Prizes were awarded in a snappy presentation ceremony in the Home's Theatre, where General Brown made his remarks. Some prizes were kindly donated by GM Susan Polgar. Many "silly" awards were also presented. A good example was a stuffed Energizer Bunny won by Army Captain Ed Pabalan for an 84-move victory. Best Performance over his Rating was won by Army Cadet Bovey Zhu. His 1837 performance raised his 1256 rating to 1440! Larry Larkins was awarded Best Game for his victories over Marine Master Gunnery Sergeant James Adkins and Retired Air Force Major Zach Kinney. Kinney, who was a JAG officer in the service, is completing a book on the history of this tournament that should be available in the near future. The organization of each year's event is rotated among the four branches of the armed forces (Air Force, Marine Corps,Army and Navy) , and this year it was the U.S. Air Forces turn. Special guest this year was Virginia resident and chess enthusiast, retired Air Force Lt. Gen. William Earl Brown. Air force organizers included: Taffinder, who is Deputy Chief Engineer for the Navstar GPS Satellite Systems; Major Charlie Musselman, a JAG officer stationed at the Pentagon; and retired Air Force Paul Waldowski. Retired Army Sergeant Dave Gavin did the website and arranged for most of the trophies, and retired Marine Staff Sergeant John Farrell brought his Marine organizational skills to the committee. Also providing inspiration and guidance was outgoing Military Chess Committee chairman, retired Marine Master Sergeant Steve Rollins. Michael Atkins directed this year. Next year's event will be organized by Sgt. Farrell and will be at Henderson Hall in Arlington, Virginia.